It's here already!!! Time for our annual Cookie Tour. Friday Nov. 13th and Saturday November 14th, Heaven On Earth,Lowery's Sewing Center and Nancy J's, will host our annual Cookie Tour. Every year we put on our aprons, bake up lots of yummy cookies, print out the recipes and share neat ideas for the Christmas season to help you get ready for the holidays. Each shop has a cookie cutter for you with a $25 purchase, yummy cookies and a drawing for a $50 gift basket. We will open at our regular time of 9 a.m. for this event. Hip Hip Hurray!!!! The bridge is done and the road is open. No more heavy equipment blocking the road or our drive. No more barricades to drive around. It was so nice of them to make sure it was done completely in time for the cookie tour. If you can't make it this weekend we hope you visit us soon. Want or need a new project. This one is called Color it Blue and is just lovely. 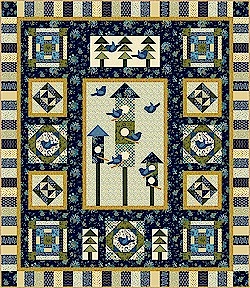 Beautiful Blues, Greens, yellows and creams will complete this quilt of birds and their nest. This is a six month project so we will complete it just in time for the birds to return for spring. First class will be Next Thursday November 19 at 6 p.m. $25 each month will complete the kit. We will also be starting a first Saturday next year. Details to follow in the next couple weeks.